2016 Nonfiction Award Finalists Announced! Drum roll, please! The finalists for the 2016 Nonfiction Award have been announced! Check them out via the video below and keep reading for the list! Congrats to all the finalists! 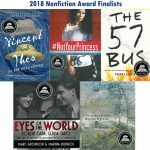 Learn more about the award, as well as read annotations for each finalist on YALSA’s Nonfiction Award page. Attending Midwinter? YALSA will host a reception honoring the finalists and the winner, as well as YALSA’s Morris Award finalists and winner, from 10:30 a.m. to noon on Jan. 11, Boston Convention & Exhibition Center, room 205BC. See a full list of YALSA’s events and programs at Midwinter on YALSA’s Midwinter wiki page. 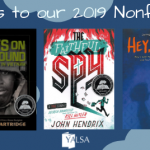 2019 YALSA Excellence in Nonfiction Award Finalists Announced! Previous Post Teen Perspective: Digitally Remastered – Comic books for gamers! Will the Hub be doing the Reading Challenges again this year? And if so, when can I start?